Deadlands fans that have adventured in The Great Maze might recognise this faction. Hailing from the charmingly named Devil’s Armpit, the 108 Righteous Bandits are a ragtag bunch of misfits headed up by T’ou Chi Chow. During his younger days, Chow spent some time in Europe and was influenced by Anarchist and Communist philosophies. In turn, this reflects how the Righteous Bandits tend to operate. They steal from the rich and greedy, but distribute their spoils to the poor and needy, like a Weird West version of Robin Hood and his Merry Men. They also stand up for the little guy against big business and robber barons, acting as Doomtown: Reloaded’s home for things related to the ‘labor’ Western trope. Their members include a large number of martial arts practitioners, so they will be your faction of choice if you fancy throwing some Kung Fu moves. The Bandits can also call upon the support of several Blessed who bring Holy magic to aid their cause. It’s worth noting that specific cards for both the 108 Righteous Bandits and the Eagle Wardens Outfits won’t be found in the base set or any expansions prior to Immovable Object, Unstoppable Force. However the earlier sets do still contain plenty of cards that you can use with them. The 108 Righteous Bandits pack a lot of versatility across their numerous dudes. They are a good home for those who want to try a variety of deck types and play styles. Their signature mechanic is Kung Fu, which provides strong shootout control options once mastered. The Bandits also have access to plenty of ways to move their dudes around town and manipulate their economy, which makes them attractive to technical players. Their dudes, movement, and economic abilities combined make them ideally suited for a ‘dudes and deeds’ approach. An important thing to note if you’re thinking of getting involved in the tournament scene is that the Outfit card 108 Worldly Desires has been banned from competitive play. Don’t let that put you off the 108, however, as they still have plenty of things going for them. 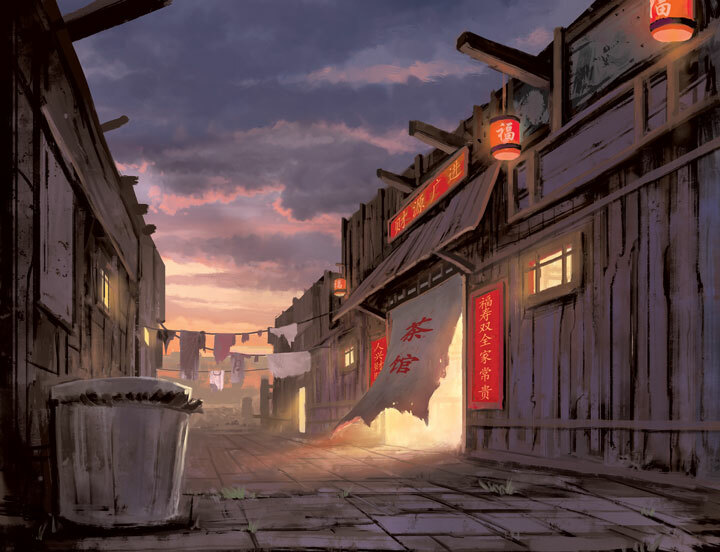 The Deadlands setting features a host of wuxia warriors, and in Doomtown the majority can be found within the ranks of the 108. Kung Fu may at first look similar to skills like Huckster or Mad Scientist, but the way it works is very different. Kung Fu dudes make use of action cards with the Technique keyword, and these are predominantly Shootout actions. Unlike spells or gadgets, they don’t attach to the dude. If the Technique belongs to a Tao, then you can play additional actions from the same Tao from your hand or discard pile in a combo, as long as the requirements set out on the card are fulfilled. Keeping track of where your Tao Techniques are is key to a Kung Fu deck – if your discard pile is small, it may not be the best time to fight, but if it is overflowing you’ll be able to unleash a devastating flurry of kicks and punches in a shootout. There are currently three sets of Tao Techniques, each with its own particular style, and a handful of other support techniques. The Tao of Zhu Bajie manipulates bullets and value to make your dude stronger at your opponents’ expense. This Tao can build up a dude into a scary big shooter. You can take advantage of your raised bullets and opponents’ lower values by bringing a Shotgun, or else finish your combo with Zhu’s Reward. If you start your shootout by Pigging Out, you get even more out of your Tao. Dudes with high bullets to start with, like Bai Yang Chen or Mr. Outang are well suited to this Tao, while Yunxu Jiang and Forster Cooke can further boost your bullets. El Armadillo Hierro can reach incredible numbers of bullets if lots of Techniques happen during his shootout. The Tao of the Jade Rabbit emphasises lightning quick movement and confusion. Your dudes can leap into and out of the shootout, potentially sending opponents home in the process before finishing with Rabbit Takes Revenge to take the most threatening opponent by surprise. Run Rabbit Run works similarly to Pigging Out, but for the Tao of the Jade Rabbit. Wang Men Wu‘s ability means that he can essentially leap out of a shootout and back in on his own. Thanks to the Gunslinger token, his posse never empties. Longwei Fu‘s trait means he can end a combo with Rabbit’s Deception and still provide a stud bonus to the posse. The Tao of the Bull Demon King absorbs damage through superhuman resilience, finishing with an uncontrolled burst of destruction. This Tao works best when defending deeds, as it isn’t possible to combo from Two Hundred Fifty Rounds if you don’t control the location of the Shootout. Behold White Bull is at its most devastating when performed by a dude with high influence. Xui Yin Chen could use it to do a lot of damage, while Shi Long Peng could use Miracles to reduce the damage to your own dudes. Outside of the Taos, we have Shifu Speaks, which can be used during Noon to set up big Kung Fu combos for the turn ahead. Focusing Chi is another card that allows for setup and card cycling. One Fights As Many starts a job that if successful can result in a lot of Control Points. Kung Fu also gets support from non-Technique cards. The 108 Drunken Masters Outfit is perhaps the best choice for Kung Fu focused decks. It also helps you get more from Baijiu Jars, which are an excellent way to put Taos into your discard pile to enable combos. Giving your dude some Nunchucks will make their Kung Fu stronger, as will taking a sip of Zui Waidan‘s special brew. Plague of Grasshoppers can be used to move your Kung Fu dudes to where they need to go. This deck has been used to great success by Khudzlin in multiple online leagues. It borrows Allie Hensman from the Sloane Gang for her ability to generate control points. Kung Fu dudes protect her by using Tao of the Jade Rabbit to control and dominate shootouts. The 108 Righteous Bandits have some of the best dudes in the game for moving around town, causing chaos at deeds and manipulating their economy. Simply by playing The 108 Righteous Bandits Outfit and starting Asakichi Cooke you’ll have the early mobility advantage over a lot of decks. You can easily bypass threats, tempt opponents into chasing you and thus putting them in bad positions, or escaping from sticky situations yourself. Daomei Wang adds to these tricks, as can Mustangs and Guide Horses, making your dudes incredibly difficult to pin down. Blessed dudes can lend support to this strategy with the Miracles Amazing Grace and Walk the Path. Having your dudes around town controlling deeds makes it cheaper to play T’ou Chi Chow himself, and his ability increases your mobility further still. Take advantage of this to position dudes where you can get the most from them. Hiram Capatch can enable your zero influence dudes to deny your opponent the chance to collect production from their deeds, or prevent them from doing the same to you. Hamshanks protects your dudes at his location from being targeted by abilities. Randall increases your hand size when he has an audience. In games where your opponent has taken a similar approach, Seamus McCaffrey can make the difference between losing and winning. Take advantage of your mobility to engage in some Righteous Banditry with This is a Holdup! In keeping with their theme the 108 Righteous Bandits have ways of generating extra ghost rock but also benefit from not hoarding their wealth. By starting the Core Deed Comphanhurst’s, the 108 can trade some of their starting stash for greater production as long as they hold the Saloon, and its trait makes many of their economy manipulating dudes’ effects more reliable. The extra production allows you to start with more upkeep without feeling the pinch. Benjamin Washington can remove the upkeep costs entirely on the first turn and Abuelita Espinoza can reduce upkeep costs by one while she is at an opposing deed. Caitlin McCue can give your Public deeds a production boost while at a Government deed, while Xiang Fang gives an immediate burst of ghost rock upon entering play but must be used carefully. This extra ghost rock allows you to get cards into play faster, and if you spend your stash quicker than your opponent you can trigger the effects of dudes like Natalya and Shizeng Lu. If you’re having difficulty spending your ghost rock then the like of Sophie Lacoste and Jim Hexter can help. Time the use of Carlton “Min” Rutherford‘s ability for when the loss of the ghost rock would make you the player with least in their stash. This combination of movement, economic strength, and ability to quickly grow the town means that many people use the 108 Righteous Bandits to build decks that are described as “Landslide” or “Dudes and Deeds”. These decks focus entirely on building their street up quickly to the point where their opponent is overwhelmed by the number of control points, Meanwhile, these decks play cheap dudes and attires to keep their own influence at a safe level. The original versions of these decks attempted to avoid shootouts altogether and so disregarded draw structure in favor of the most efficient cards, but the metagame evolved to counter this approach. Modern variations on this strategy can often have a plan for dealing with shootouts, and Rich Carter’s win at the 2017 World Championships with such a deck demonstrated its effectiveness. I’ve already touched upon a couple of uses for the 108 Righteous Bandits’ Blessed dudes above. Though few in number compared to their counterparts in the Law Dogs, they still provide useful support to the outfit. One thing unique to the 108’s Blessed is their interaction with Miracles that have the Hymn keyword. While there are only two such spells at present, they are both useful to the 108. Stevie Lyndon gets a massive +4 bonus to his Blessed skill when casting Hymns, meaning he can successfully cast Amazing Grace even if he pulls a 2, allowing you to run both Hymns in the same deck. As long as Lucretia Fanzini is in the town square, she can sing Onward Christian Soldiers to benefit your dudes in any in-town shootout without needing to be in the posse. He Fang and Shi Long Peng round out the numbers of the 108 Righteous Bandits’ Blessed dudes, and both are also able to use Kung Fu. Combining the casualty reducing Miracles Get Behind Me, Satan! and Shield of Faith with the Tao of the Bull Demon King will protect your dudes from White Bull‘s fury. Mixing up Kung Fu and Sentinel would make an interesting challenge. Outside of Kung Fu, Dumbstruck and Walk the Path can be used alongside Amazing Grace to support your movement tricks. He Fang also has good synergy with his other half, Xiang Fang. forkbanger’s deck from the recent Epitaph event series incorporates Blessed. He uses Stevie Lyndon with Onward Christian Soldiers alongside Tao of Zhu Bajie Kung Fu and Xui Yin Chen. With the combined bullet bonuses and protection from opposing bullet modification, it makes those Shotguns and Legendary Holster much harder to counter.